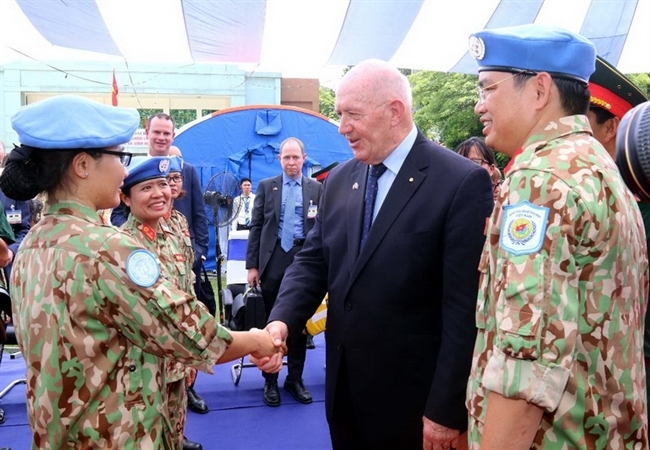 Australian Governor-General Peter Cosgrove and his spouse left Ho Chi Minh City on May 26, concluding a State visit to Vietnam from May 23-26 at the invitation of President Tran Dai Quang. - Vietnam and Australia officially established the diplomatic relationship on February 26, 1973. - Over the last 45 years, they have developed a strong partnership, especially since the establishment of a comprehensive partnership in 2009 and the signing of a declaration on an enhanced comprehensive partnership in March 2015. The bilateral relationship has developed extensively and intensively in many fields. 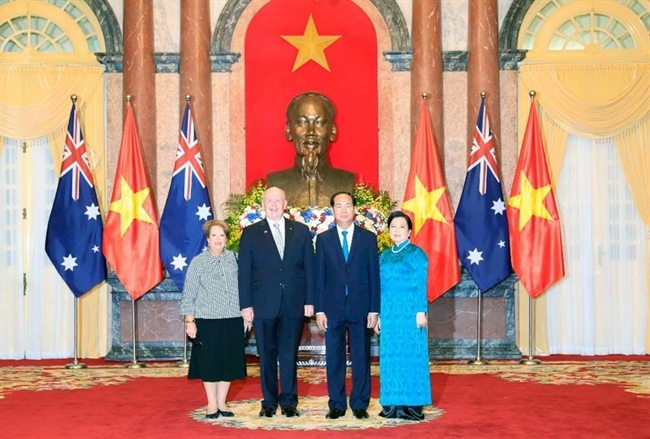 During his stay, the Australian Governor-General had talks with President Tran Dai Quang, and meetings with Party General Secretary Nguyen Phu Trong, Prime Minister Nguyen Xuan Phuc, Chairwoman of the National Assembly Nguyen Thi Kim Ngan and Chairman of Ho Chi Minh City People’s Committee Nguyen Thanh Phong. He visited Vietnam's level-2 field hospital No. 1, based at Military Hospital 175 in Ho Chi Minh City. 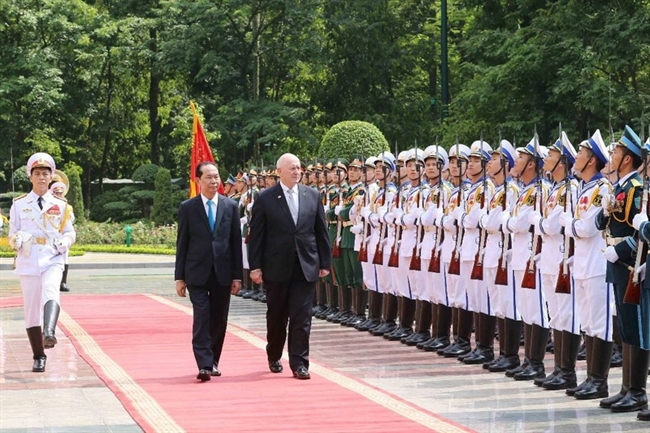 On the occasion, Governor-General Cosgrove laid a wreath at the Monument to Heroic Martyrs and paid tribute to President Ho Chi Minh at the Vietnamese late leader’s mausoleum in Hanoi. At the meetings, both sides expressed their delight over the sound and effective development of the bilateral ties. 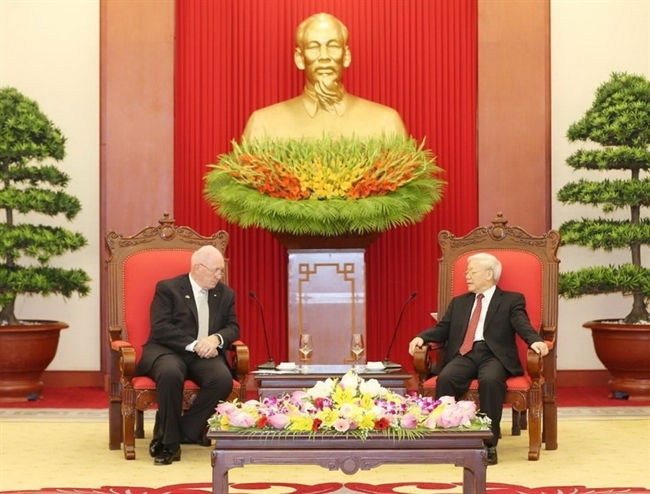 They agreed to continue with activities to mark the 45th anniversary of the diplomatic ties and raise two peoples’ awareness of the Vietnam-Australia relations. Regarding the orientation for the strategic partnership in the coming time, they reached consensus on consolidating political trust and strategic faith through enhancing delegation exchanges, improving efficiency of existing bilateral cooperative mechanisms while setting up new cooperative frameworks like economic partnership, agricultural partnership, innovative partnership and meeting at foreign ministerial level. In March 2018, the two countries elevated their ties to the strategic partnership. 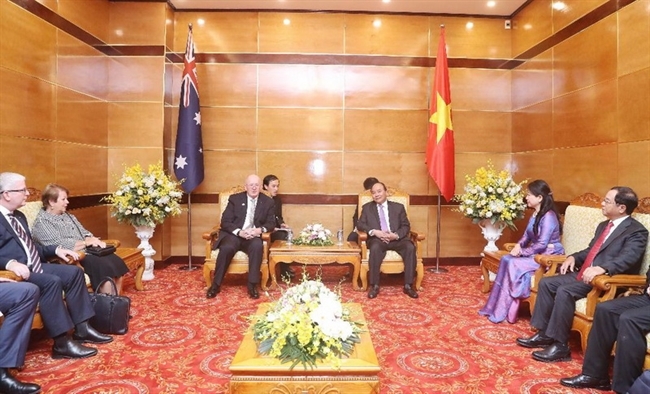 Australia considers Vietnam a key partner in the Association of Southeast Asian Nations (ASEAN). They stressed to deepen pillar cooperative sectors: security-defence, economy-trade, science-technology, education-training and development assistance, saying that they will serve as levers to boost collaboration in other potential fields. Both sides will create favourable conditions for their airlines to operate more direct flights between big cities and encourage citizens to involve in the Vietnam-Australia Work and Holiday program. They affirmed to support each other at the regional and international forums, especially at the UN, ASEAN and mechanisms led by ASEAN. They pledged to coordinate stances regarding the East Sea issue and cooperate closely to implement the Comprehensive and Progressive Agreement for Trans-Pacific Partnership (CPTPP). 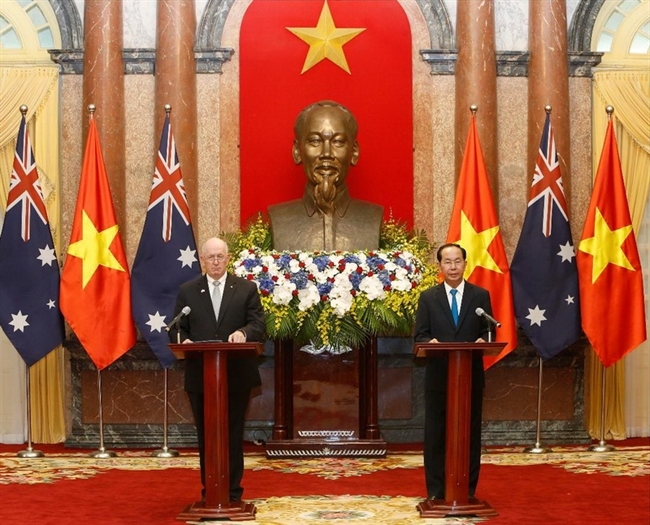 Over the past 45 years, the relationship between Vietnam and Australia has obtained significant achievements. The two nations have focused on economic and trade cooperation which have contributed to promote their economic development. Australia now ranks 20th among 126 countries and territories investing in Vietnam with 412 investment projects worth 1.8 billion US dollars. The projects focus mostly on industry and construction, processing industry, services, education, and agro-forestry-fisheries. 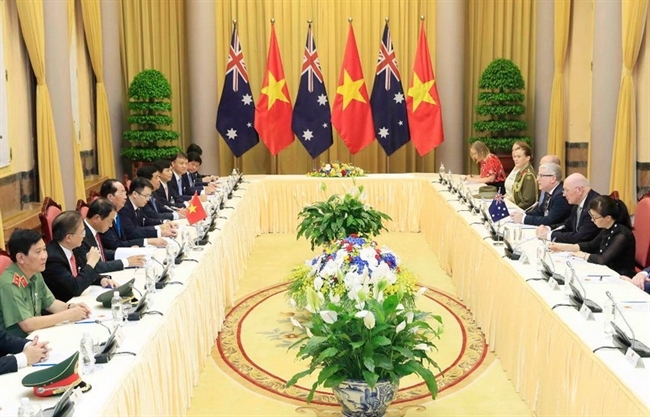 Australia is now the eighth largest trade partner of Vietnam. Two-way trade annually grows at an average of over 7 percent, reaching nearly 6.5 billion US dollars in 2017, a year-on-year rise of 22.2 percent. Vietnam exported over 520 million US dollars worth of goods to Australia, mainly aquatic products. Australia has opened its door for Vietnamese fruits like lychee, mango and dragon fruit. 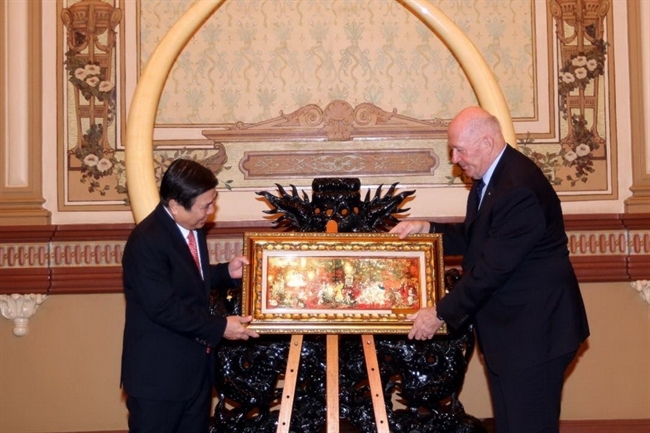 Governor-General Peter Cosgrove during their meeting in Ho Chi Minh City. Ho Chi Minh City which has taken part in United Nations peacekeeping activities. 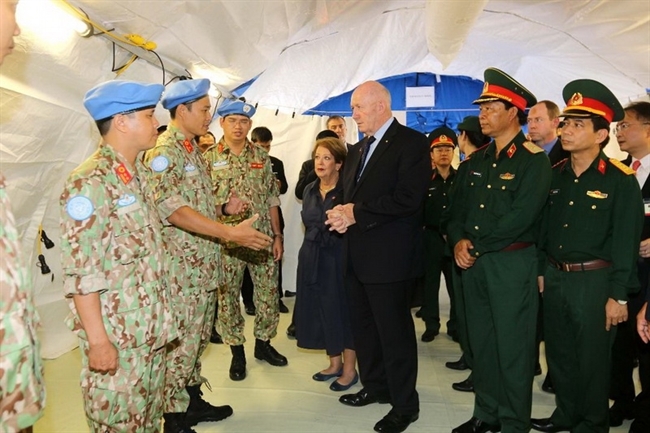 Governor-General Cosgrove meets with doctors and soldiers of level-2 field hospital No. 1 in Ho Chi Minh City. 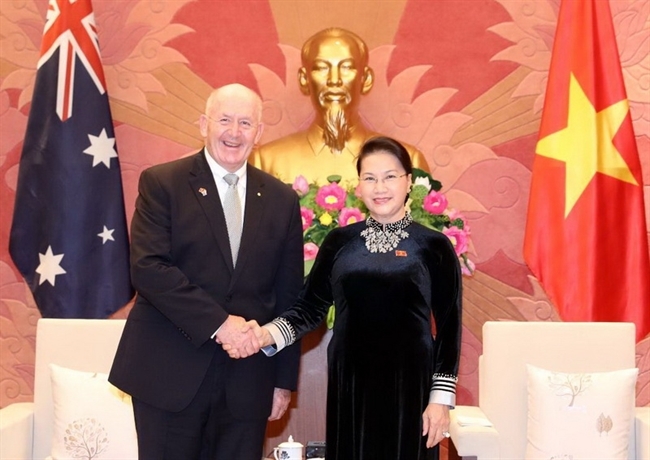 The Governor-General attends the 45th founding anniversary of Vietnam-Australia diplomatic ties held in Ho Chi Minh City. 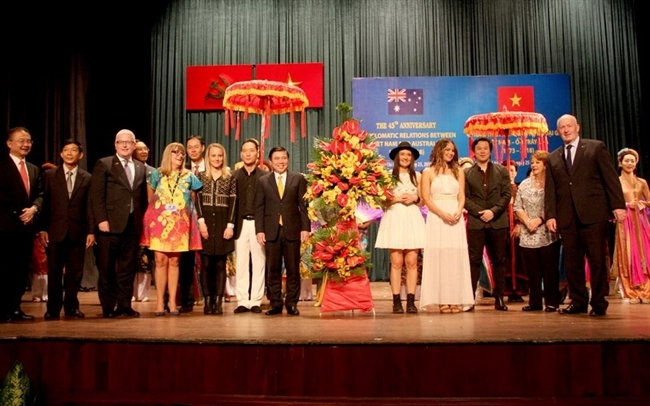 In the photo: The Governor-General (first right) presents flowers to artist performing at the ceremony. Vietnam now has 44 investment projects in Australia with total capital of 387.1 million US dollars, concentrating on processing and manufacturing, arts, entertainment, mining and services. The official development assistance (ODA) constitutes an important factor in enhancing the bilateral relationship. Australia is one of the biggest providers of non-refundable ODA for Vietnam, reaching an average 92.7 million AUD/year in the 2013-2018 period. The Australian Government has provided active and effective development assistance for Vietnam over the past time, including the construction of My Thuan and Cao Lanh bridges in the Mekong Delta region. Australian-funded ODA has supported Vietnam on the sectors of the country’s need like infrastructure, agricultural and rural development, poverty elimination, climate change response, and development of high-quality workforce. Nearly 30,000 Vietnamese students are studying in Australia; about 60,000 Vietnamese graduates in Australia are working in Vietnam and around 1,000 Australian students visited Vietnam under exchange programmes and the New Colombo Plan. Bilateral cooperation in education and science-technology is also growing. Regarding education, Australia is providing nearly 100 scholarships annually for Vietnamese students. Around 30,000 Vietnamese students and postgraduates are studying in Australia at present. In the field of science and technology, Vietnam is one of the 17 countries benefiting from Australia’s science and technology cooperation initiative. 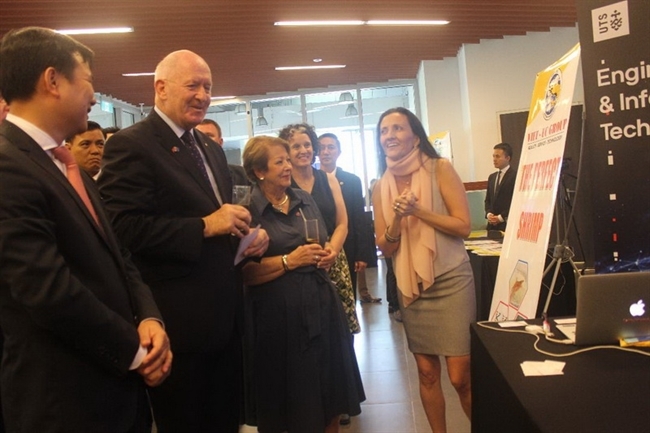 Australia helped Vietnam to establish the Climate Innovation Centre in Hanoi to promote start-up models in climate change adaptation and environmental protection.